Warren Zanes utilizes half his talent in this biography, and delivers weak Tom Petty tea to starving masses of fans. I’ve said it before and I’ll say it again: Tom Petty’s music saved my life. For all his 40 years keeping a band mostly together in a music industry that’s digging itself a deeper hole by the minute, there really isn’t a lot of good secondary source material on Petty. Really, there are only two places a serious fan can go for a serious inside look: Peter Bogdanovich’s four hour documentary, Runnin’ Down a Dream, and Paul Zollo’s thorough and straight interview collection, Conversations with Tom Petty. The primary asset of both is that they capture the band leader by using his own words. Indeed, these are direct quotation endeavors, and though of course the other band members are in that orbit and saying their various says, Petty’s voice rings true in both documents. A lot of people don’t know that the Bogdanovich documentary also resulted in a companion book of a little over 200 pages that is a solid cross-section of stuff from the film, plus additional interviews and photos that didn’t make the final cut. The additional interviews, as well as the editing of this companion book, were done by Warren Zanes. That means Zanes is to be trusted, and there are many other reasons why he ought to be trusted, as well. His old band, the Del Fuegos, was tight. His subsequent solo work has been decent. He has a Ph.D. in visual and cultural studies that he worked hard to get. He has an excellent record of service as the Rock and Roll Hall of Fame’s vice president, and now he works for Steven Van Zandt’s foundation. Zanes has been around many different blocks many different times, and he has been knee-deep in Petty trivia for a good long while. 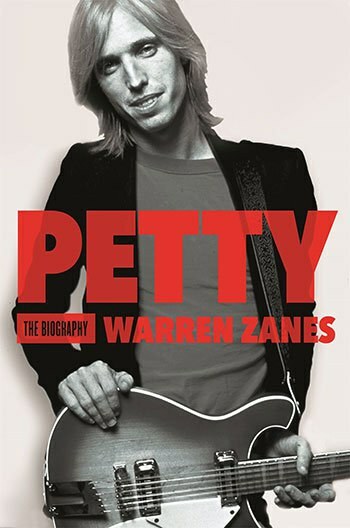 As a giant Pettyhead and a firm believer in Zanes, I was so beyond excited to review Petty: The Biography that I called dibs on it months and months ago, the moment I heard that it would someday exist. So it’s a little confounding and a lot disappointing to me that I didn’t really get much out of this book. Petty: The Biography is a comprehensive entry point for casual fans, definitely. And I am trying not to be one of those superfans who trashes it because I think I could’ve done it better or whatever. But the thing is, Zanes has himself already done it better with the Bogdanovich companion. Petty is comparatively light on direct quotation. Reading Petty’s own words showcases a voice that is wholly its own thing in cadence, simplicity, and honesty. In this book, Zanes lays on a level of rhetorical device, adjective choice, and framing that shows clearly how much he is editorializing instead of showcasing the band leader as-is. Where there is a significant amount of direct quotation, the voices ringing the loudest are those of his eldest daughter, Adria Petty, and the only member of the band who got fired and never came back, Stan Lynch. The commentary from Adria is fresh and wonderful, as Petty has always been closely guarded about his two marriages and his children. Her input makes clear the harsh dualities of being raised in Pettyland. On the one hand, she shows a profound respect for her father’s intense gifts and investments in musical arts as well as a gratitude to his second wife, Dana, for keeping him a little more even-keel on the road and ensuring his priorities emphasize his family. On the other hand, she makes no bones about long resenting how he abandoned his kids to the terrors of his mentally ill first wife, Jane, whom he may have been suckered into marrying as a teenager at the last minute before heading to California to try to get a record deal. He let the abusive marriage drag on for years after even the kids knew it was over, and was so destroyed by it himself that he could not look after his children. There’s a reveal in there about his depression and a bout of heroin addiction that was cut from the Bogdanovich film because Petty doesn't want to glorify any drug use. He was in a real bad place, he coped in a ugly way, and he fortunately got medical help to shake himself out of it, where most other people in that situation end up dying like Howie Epstein. I’d love to do a round-up of top ten things I learned from this book, but beyond that heroine bit, I’m not sure I could find nine other things. Especially in the first half of the book, Zanes leans heavily on quotes from Lynch. Lynch was a killer live drummer and a pretty hard partier because he was single when he was a Heartbreaker. He often crushed it in the studio during recording sessions, too. But Lynch’s lines all point toward much more about him than anything valuable about the band. He was fired for being a manipulative, wedge-driving, oppositionally defiant jerk who shot his mouth off, a lot, for no reason. As much as Zanes tries to use his quotations to show how this excellent and easy-flowing live band struggled with how best to handle their studio time, it really just reveals that, indeed, the Heartbreakers were better off without Lynch’s progressively more hostile and sulky monkey-wrenching. The music he made was great, but he was tearing the band apart. His contributions to this book show him to be an unreliable narrator and still quite a jackass after all this time, harping on the same complaints about Jimmy Iovine and Rick Rubin that got him canned in the first place. Beyond the somewhat greater insight into Petty family drama and drug use, there's very little news to report. At one point, Petty explicitly denies that he and Stevie Nicks were ever more than close friends, but then a few pages later he vaguely walks it back and admits that from the outside of their friendship it would certainly look like a relationship. Notably, Zanes either didn’t ask Nicks the same question or he was disinclined to print whatever she said. The quotes from Nicks are a classic flavor of Nicks, equal parts forthright and flaky. Zanes does cover the timeline of the Petty-Nicks connection in fairly solid detail; that ground has just been covered before. The only other person Petty is known to have had that kind of deep connection with is the late George Harrison, and while Olivia Harrison weighs in a few times on her husband’s behalf, this would’ve been an extremely fruitful, untapped area where Zanes could’ve broken new ground. Even the Traveling Wilburys don’t get much page space, though the early part of their career when the Heartbreakers toured as Dylan’s backing band gets a decent amount of consideration. One of the main responsibilities Zanes has with this book is to fill in the gaps between the other two great documents and the current moment. Conversations with Tom Petty was published in 2005 and Runnin’ Down a Dream came out two years later. So there’s about a decade of totally untouched history for Zanes to lay out. This includes Highway Companion, The Live Anthology, Mojo, Hypnotic Eye, and the Mudcrutch reunion work. Highway Companion, which was released in 2006, doesn’t get a mention until midway through chapter 23—in a book that has24 chapters. The entire fourth decade of Petty’s career is covered in about twenty-five pages out of the three-hundred total pages in this book. And much of those last few pages is just the usual pontificatory praise for his legacy in general. Zanes rightly argues that Petty’s extreme discipline has, for 40 years, yielded a series of albums where every one of them has strong potential to be greater and more timeless than the last, so the fact that Zanes devotes almost no time to considering Petty’s last five albums is downright unforgivable. The salt on the wound is that you look at the other things Zanes has done, and you just known damn well that he could’ve done a better job on this one. His work on the Bogdanovich book was great. His Dusty in Memphis book for the 33 1/3 series is so perfect that it was a large part of what convinced Petty to allow access for this biography in the first place. Zanes has a musician’s sensibility crossed with an academic’s knack for analysis, and a fan’s adoration for Petty’s work that could have resulted in a truly deep and meaningful dive into the life and work of a man who’s life and work have been shrouded in mystery for just about forever. Instead of going for the extensive heavy hitter of which he is fully capable, Zanes went for a nice little capsule read. I’m sure there are one or two items in the book that will make Petty and the rest of the band uncomfortable enough to feel that Zanes really told the tale. I’m sure everybody will praise the living daylights out of this book, because we’re all just starving for anything that puts us an inch closer to cracking the shell of this incredibly talented band leader. Reflecting on the totality of their time together, Petty’s righthand man, Bugs Weidel, concludes that Petty is a remarkable human being because he strives constantly to be honest in his work and to improve himself in every way he can. It’s a steep mountain to climb, but it’s the chief lesson from Petty himself that I have always tried to personally incorporate into my own way of living. So it’s with a truly heavy heart and apologies to both the band and Warren Zanes that I have to admit: this book could’ve been a lot better.